George Orson Welles ( May 6, 1915 – October 10, 1985) was an American actor, director, writer, and producer who worked in theatre, radio, and film. He is remembered for his innovative work in all three: in theatre, most notably Caesar (1937), a Broadway adaptation of William Shakespeare‘s Julius Caesar; in radio, the legendary 1938 broadcast “The War of the Worlds“; and in film, Citizen Kane (1941), consistently ranked as one of the greatest films ever made. Lee Marvin (February 19, 1924 – August 29, 1987) was an American film and television actor. Known for his distinctive voice and premature white hair, Marvin initially appeared in supporting roles, mostly villains, soldiers, and other hardboiled characters. A prominent television role was that of Detective Lieutenant Frank Ballinger in the NBC crime series M Squad(1957–1960). Willard Carroll Smith Jr. (born September 25, 1968) is an American actor, producer, rapper, comedian, and songwriter. In April 2007, Newsweek called him “the most powerful actor in Hollywood”. 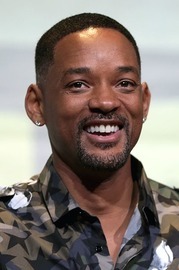 Smith has been nominated for five Golden Globe Awards and two Academy Awards, and has won four Grammy Awards. George Harrison MBE (25 February 1943 – 29 November 2001) was an English guitarist, singer-songwriter, and producer who achieved international fame as the lead guitarist of the Beatles. Often referred to as “the quiet Beatle”, Harrison embraced Indian culture and helped broaden the scope of popular music through his incorporation of Indian instrumentation and Hindu-aligned spirituality in the Beatles’ work. Although the majority of the band’s songs were written by John Lennon and Paul McCartney, most Beatles albums from 1965 onwards contained at least two Harrison compositions. His songs for the group included “Taxman“, “Within You Without You“, “While My Guitar Gently Weeps“, “Here Comes the Sun” and “Something“, the last of which became the Beatles’ second-most covered song. Philip David Charles Collins LVO (born 30 June 1951) is an English drummer, singer-songwriter, record producer and actor. He was the drummer and singer of the rock band Genesis and is also a solo artist. Between 1982 and 1989, Collins scored three UK and seven US number-one singles in his solo career. When his work with Genesis, his work with other artists, as well as his solo career is totalled, Collins had more US Top 40 singles than any other artist during the 1980s. His most successful singles from the period include “In the Air Tonight“, “Against All Odds (Take a Look at Me Now)“, “One More Night“, “Sussudio“, “Two Hearts” and “Another Day in Paradise“.